This is my favorite way to tighten, exfoliate, and revive drab skin. The ingredients are simple, and afterwards the skin feels smooth, tight, and full of life! This mask can be done using plain water OR apple cider vinegar (I prefer the latter) and in my blog post I detail the reasons for using either one. Of course your favorite essential oils can be used as well. 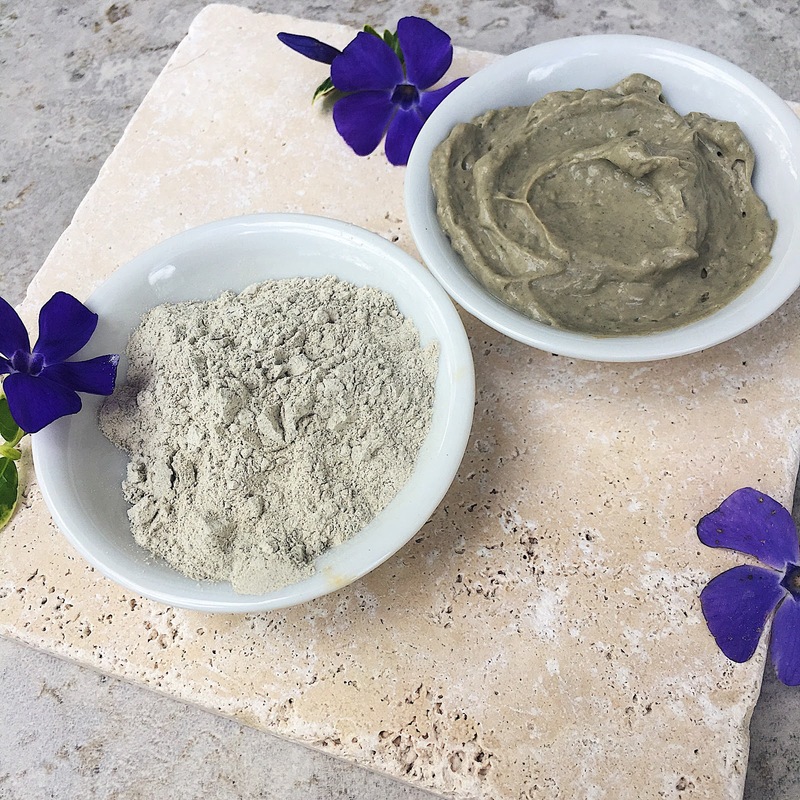 Bentonite clay is inexpensive to buy, especially when you compare it to more conventional skincare products, it's natural and from the earth, and it contains ZERO chemicals or additives. Due to the nature of the clay, as it sits on your skin it will increase circulation underneath. The payoff is that your body will be doing everything that it needs to in order to move blood around under the surface, and as a result, push toxins out through the pores. Sometimes, you can feel this process as it occurs, as warmth in the face, and you may even feel your own pulse as the circulation increases! This is totally normal. I always do this mask at night because after getting all that blood pumping, my face is usually a bit flushed afterwards, and the redness can stick around for a little while after. Don't be alarmed at these processes, it means it is working. Just remember that with any new beauty product or regimen, it's always best to test a small amount on your skin first before using a full application. -A clean foundation brush to apply the face mask with IF you desire. This is optional. I use my fingers, easier to clean after. -A hair tie to hold hair back and a wide headband or scarf to wear at the hairline to keep baby hairs in check. 2. Add a little bit of ACV or Water a little bit at a time, mixing thoroughly, until mixture resembles a smooth paste. Start with 1 or 2 teaspoons of liquid and then begin adding it just a few small drops at a time. It will thin out quickly and if you add too much liquid, you'll have to add more clay to balance it out.. which will just be a waste of ingredients. Go slow. 3. There may be some small chunks that won't disappear, this is fine, and if you leave the mixture to sit at room temperature for a few minutes, they will probably dissolve as the clay particles absorb more liquid. If you don't feel like waiting though, go ahead and smear that stuff on, chunks and all! It's not going to hurt anything. 4. Once the mixture resembles the consistency of yogurt or pudding, apply it to your face using a VERY clean foundation brush, or your fingers. Avoid the lips, eyebrows, and the thin skin around the eyes. If you have excess leftover you can apply it to your chest and neck, but be aware that the mask may harden in some areas, and that will make it difficult to move or turn your head. Which may be funny at some point in time, but it might not be funny while you're trying to get your chill on. 5. Leave the mask on for 15-20 minutes. If it's your first time and you aren't sure how your skin will respond, try just 5 minutes as a test run. Rinse with lukewarm water, using a washcloth to help wipe away the clay (I do this in the kitchen sink because there's more room and it can be a little messy) pat dry with a clean towel and moisturize. I love to use almond oil with a drop or two of lavender in it to help tone down redness. OPTIONAL: Apply a moisturizing mask instead, see recipe below. After rinsing and drying, apply a moisturizing mask. You can use mashed avocado with a little bit of olive oil, for a really amazing moisturizing experience. Leave it on for 10 minutes or so and then remove. Your face will feel so fresh! It may look a bit oily at first, but my suggestion is to leave it alone and let those oils work their magic overnight. You will awaken to a lovely, soft, silky face. Disclaimer: All skin types are different. The way that one body responds to these ingredients may be different from another person's bodily response. Use your best judgement and always test a small amount of product on your skin before applying a full application. This goes for ANY new skin products, whether homemade or store bought. My blog posts are about sharing my own experiences, I am not suggesting or implying that you do anything to your skin that may damage it. My experience with these products has always been safe and harmless. As stated previously, everybody is different and therefore my experience may differ from yours.